Sakshi Maharaj had threatened his party last month before it declared him as its candidate from the constituency. 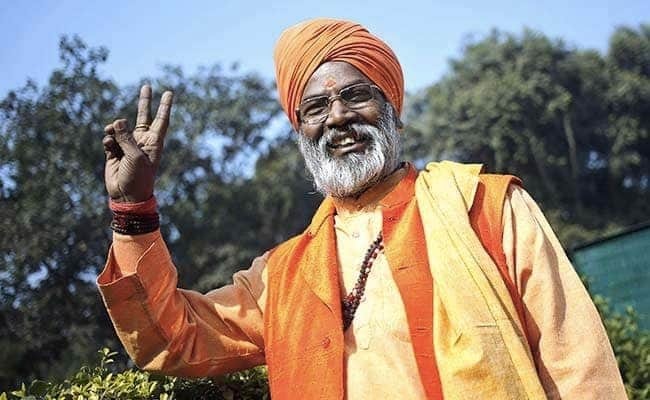 Sakshi Maharaj, BJP's Unnao candidate, on Friday made an unusual pitch at an election meeting in his constituency as he said those who won't vote for him in the national election will attract "bad karma". "When an ascetic comes at your door, seeking alms, pleading, and if his pleas are not heeded to, he might walk away with your good karma and handover his bad karma," the leader said at an election meeting. Sakshi Maharaj, who had won in Unnao in 2014 with a massive margin, threatened his party last month before it declared him as its candidate from the constituency. "But, if the party takes any other decision pertaining to me, then there is every possibility that the people of the state will feel hurt and the result may not be good," he had said in a leaked letter. Sakshi Maharaj is known for his highly controversial comments. In a shocker last year, he had demanded that Delhi's iconic Jama Masjid be demolished as, he claimed, it was constructed on the ruins of a Hindu temple. "The first statement I made in Mathura after entering politics was: Let Ayodhya, Mathura and Kashi be and demolish Delhi's Jama Masjid. If you don't find Hindu idols beneath its staircase, you are welcome to hang me," he had said at a public rally in Unnao. Last month, his prediction that there won't be any election in 2024 triggered a controversy. "The Modi tsunami has awakened the country. I feel there will be no election in 2024... this is the only election and we are fighting it in the name of the country with full honesty," Sakshi Maharaj had said. Many opposition leaders have levelled allegations against the BJP government at the centre of subverting institutions, claiming there won't be any election if Prime Minister Narendra Modi gets a second term in office.